...unfortunately, if you're raised as an urban dog and it's lambing time, you're expected to go against millions of years of evolution to say..."I must not play rough with the sheep, NO NO !!! i must not 'play' with the sheep at all, or the chickens for that matter"
Pedro, our beautiful border collie couldn't fight her nature and so it was that the farmers on either side of us came to visit with a ute load of 10 savaged and mutilated lambs collected from the immediately surrounding paddocks. Given the ultimatum of 2 days to get rid of the dog or they will, I was thankful. They didn't have to, cos being raised country i know the rules eh and if they'd said, 'you owe us 1000 dollars for the lambs or we own the dog, in which case hand it over so we can exact rural justice upon it', i would have. As it happened, in informing the older kids on holiday that we might not have a dog when they got back, i found the ex was in the market for a dog. Not just any dog though and that she'd be prepared to have our dog. So it was that we arranged for me and the littlies to travel to Christchurch to relocate Pedro and by doing so, save her life. The morning before i leave, one of the farmers turns up again and says a strange dog has been spotted in the area so he can't guarantee it was Pedro killing their lambs. By the afternoon they'd seen the strange dog kill 2 lambs right in fornt of them, so put a bullet in it for its troubles. Turns out the dog is a pighunter thats been microchipped so theres a good chance of finding the owners and getting compensation. The dead lamb total now stood at 17, having found a few more around the back paddocks. When first told about, and having seen the state of the lambs i couldn't quite rationalise that our timid and playful, harmless family dog could have done such damage. 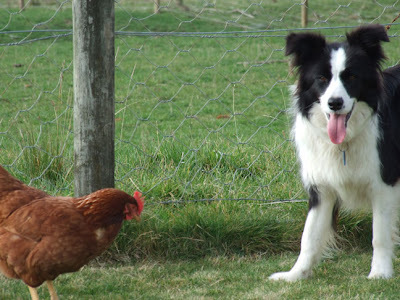 Even the chickens we reluctantly accepted that she'd killed a while back had never been found, so there just wasn't the evidence that our dog was a psycho killing machine. Just to be safe, cos i don't trust the farmers wouldn't shoot Pedro if they saw her in a paddock, and we couldn't trust that she wouldn't slip her collar and go wandering off, we went through with plan A. Now Pedro lives in Christchurch on a 3 month trial to see if she'll bond with the ex. If not, we'll see if we can have her back as by then the farmers would be more forgiving, the lambing season would have passed and we'd be more commited to putting the time in to training her not go anywhere near sheep. nice dog polly - I had a newf for 11 years and when he died I just couldn't have another dog - very difficult without the room to let them be themselves - not that a newf needs much looking after just a swim 3 times a day. Hope the dog settles in. Wow such a crazy story your dog looks absolutely beautiful. I hope things work out in your favor! ...the ex and the dog bonded, survived 3 earthquakes, had enough of Christchurch and have both moved to Auckland to live permanently.